Several friends are interested in single-handing the M16 scow in 2011. Most of the modifications to accomplish this are straightforward, like running control lines aft so they are within reach. But one task was a brain teaser: making the bilge boards swing easier within the slots. One of the great advantages of the scow are two bilge boards that are manipulated on every tack. Now, some might say a center board has the advantage because its board is not changed on the tack, and might only be raised when running. 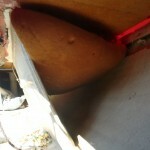 But bilge boards are canted down and out about 17 degrees, providing a bit of lift and allowing greater pointing. This is one big reason three scows (A, E and I-20) are among the fastest 10 swingboard boats in the Portsmouth Handicap ratings. Out of its slot, you can see the bilge board has rub marks. Hmmm... Click to enlarge photo. But if you are pivoting them every tack or gybe, they need to swing freely. And on the M-16, the boards were sticking. We pulled the boards this winter and could see rubbing marks where they had come into contact with the interior surface of the board slot. I talked with a couple scow racers about this. 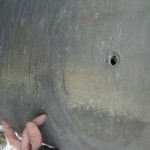 Two were convinced this was a result of boards that might have been bent when they were used to right the boat. Bent boards will rub inside the slot. But when we pulled them, they were straight as a, well, board. Next, we checked for foreign objects. Sure enough, there was some buildup of top coat on the top of the slots. But sanding these did not help…something was still binding the boards in the slots. The culprit: closed cell foam below deck pushed against the board case and deformed the slot. That is when I disc0vered the closed-cell flotation foam installed below the deck, between the hull and the board case. Here was the answer to our engineering whodunnit. When this foam dried, it expanded and deformed the case, narrowing the slot and rubbing the fiberglass against the boards as they went up and down. The slide show below describes the evacuation of the foam. Afterword: I spoke with Jason Brown of White Bear Boat Works, the successor to Johnson Boat Works where this M16 was built in 1974. Jason told me he did not think this foam was part of the original build, but might have been added on by a previous owner. Jason, by the way, is great grandson of the inventor of the inland scow: J.O. Johnson.